It was a gauntlet, to be sure. At the regional, sectional and state levels, New Glarus faced stiff competition. And at each level, the Glarner Knights came through. The final hurdle came Saturday afternoon at the Kohl Center in the WIAA Division 4 state-title game. New Glarus played inspried, controlled basketball for a full 36 minutes to hold off a very good Lourdes Academy squad and post a 67-62 victory, the first in the history of the school in boys' basketball. The triumph over Lourdes Academy -- on the heels of regional wins over Luther and Mineral Point, sectional wins over Fennimore and Belleville, and a state semi-final win over Roncalli -- gave New Glarus a 26-2 record, the best in school history, under 17-year head coach Travis Sysko. "This tournament run has been ... when you play Mineral Point in the second game ... that's quite a challenge," Sysko said. "But the guys rose up and met the challenge." The player who rose up the most for New Glarus on Saturday was senior point guard Jaden Kreklow, a difficult-to-guard, 5-foot-10 maestro with the ball in his hands. Kreklow finished with 22 points and 4 assists while handling the ball the majority of time for the Glarner Knights. "Kreklow is very shifty and is the best guard we faced all year, bar none," Lourdes Academy coach Brad Clark said. "He is so tough to keep out of the lane. He's really a good player." Sysko echoed Clark's praise of Krekolow. "When the game is on the line, you don't see him get rattled," Sysko said of Kreklow, who is headed to UW-Platteville in the fall but remains uncertain about whether he'll play basketball. "He's as cool a player as we've ever had with the game on the line.He's the best player to ever come through New Glarus." Another key performer for New Glarus on Saturday was senior wing Trevor Gassman (6-0), who scored just 5 points and grabbed 5 rebounds, but did a stellar job guarding Henry Noone, Lourdes Academy's 6-foot-2 senior wing and the state's top three-point shooting threat. Noone finished with 11 points, but made just 1 of 5 attempts from three-point range. He came into the contest averaging nearly five made triples a game while shooting a remarkable 57 percent from outside the arc. "Number 30 (Gassman) did an excellent job of running me off the three-point line," Noone said. "He was a tough defender and made it tough for me to get good looks." Sophomore Mason Martinson (6-4) used his strength and aggressiveness around the basket to score 17 points and haul down 9 rebounds for the Glarner Knights. Another senor, guard Zach Feller (6-1), contriubted 12 points and 6 rebounds to the New Glarus' cause. 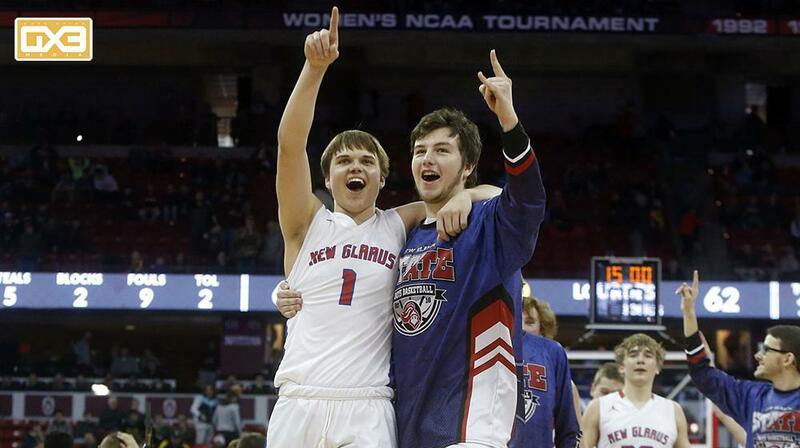 "It's not easy to get here ... it's been 87 years for New Glarus to get back to the state tournament," Sysko said. "We played the toughest schedule we've ever had to prepare us for a tournament run and I think it did." The game was close throughout and featured 12 lead changes. Lourdes' largest lead was three points and New Glarus' biggest advantage was five points. Lourdes had the ball down two with 1:46 left, but the Knights turned it over at 1:26 and New Glarus followed with two made foul shots by Kreklow for a 65-61 lead with 1:06 remaining. "It was 63-61 and we turned it over on a crucial possession ... it was just crucial," Clark said. "They came down and scored and after that, it was tough to come back." Sophomore point guard Preston Ruedinger (6-1) had 17 points and 5 assists for Lourdes while senior forward Hayden Jones (6-3) added 16 points and 10 rebounds. "We left a lot of shots on the rim today," Clark said. "Those are shots we normally make. For some reason, our legs gave out a little bit at the end. Fatigure became a factor for us. But that's a good team. Congratulations to New Glarus."